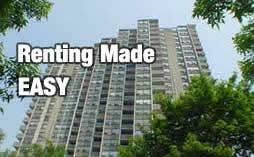 :: Rental Listings :: Landlord rental services! Place your FREE online web rental listing TODAY! We have thousands of rental listing searches on our web site every day! Landlords - Sign Up Now! Our online rental listings are easy to configure and set up! There's a variety of information you may provide about yourself, company, rental unit, and building information. You can configure a number of rental listings on our site and track the number of visitors to each of your rental listings! Each of our rental listings also allow you to upload up to 12 digital photos of your property! We also have 3D panoramas for all your rental listings! Our easy to use Property Box ID system allows you to market your rental listing property easily and efficiently. Advertise your rental listing in the paper and other advertising sources easily by providing a simple link: www.rentershotline.ca/2001 ! Then track exactly how many visitors saw your rental listing. Renters - want to search our rental listings? Click Here!